This electronic publication is Special Publication 17 from the Karst Waters Institute, consisting of papers presented by invited speakers and other conference attendees. The focus of the meeting was on carbon (organic and inorganic) in karst and the technical sessions were organized to emphasize either a boundary or the processing of carbon: the upper boundary (surface/epikarst), the lower boundary (vadose/phreatic), lateral inputs and outputs, carbon (sources and quality), and microbial processes. For sessions that were organized into boundary zones, the presentations included research designed to advance our understanding of the physical, geochemical, and biological processes involved in the transport, transformation, and storage of various forms of carbon. 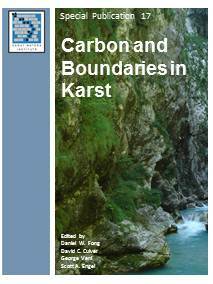 Recommended Citation: Fong, D.W., Culver, D.C., Veni, G., Engel, S.A., 2013, Carbon and Boundaries in Karst. Abstracts of the conference held January 7-13, 2013, Carlsbad, New Mexico. Karst Waters Institute Special Publication 17, Karst Waters Institute, Leesburg, Virginia. 54 p.